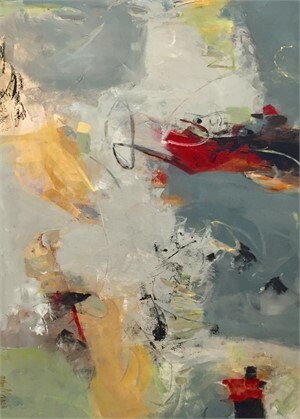 Maney began her art education by attending various institutes, classes at Belmont University, Watkins, and Vanderbilt University as well as studying with renowned artist Anton Weiss for six years. Starting with watercolor and collage, she moved into painting acrylic and finally, falling in love with oil painting. 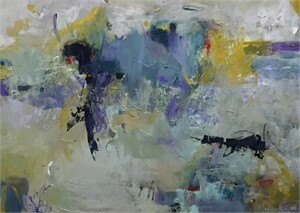 Maney has exhibited in several solo and group shows receiving numerous awards. Collectors of her work are both domestic and International. ​One of her Maney’s favorite series happened after she looked over her photographs from a wonderful trip to Australia and New Zealand in 2011. Wanting to paint something based on her images and not painting in a realist manner, she found a way to translate the scenes into her abstract style naming the Series Australia and New Zealand on My Mind. France was their next trip in 2013 and she named the Series Liquid Light using Golden’s liquid acrylic paint and because Paris is the City of Light. This series incorporated a predominately cream and light colored palette reminiscent of the old world cityscape and countryside structures that piqued her delight and imagination. She will continue traveling, taking photos and translating them into her own interpretation. ​Labeling herself an abstract expressionist, Maney starts in a chaotic manner with layer after layer of color and strokes, finding a balance between intensity and motion. Using brayers, credit cards, squeegees, and fingertips in addition to brushes, she continues in an intuitive style. ​Born in Murfreesboro, TN. 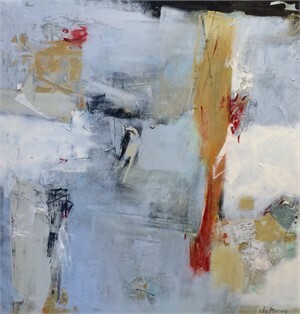 Maney has been committed to painting abstract for over two decades. Attending the University of Georgia, she earned her B.A. in Social Work. Living in Nashville, TN. with her husband, Jerry and her cat, Abstract, she enjoys traveling, exercise and serving meals from recipes of famous artists, especially Monet. 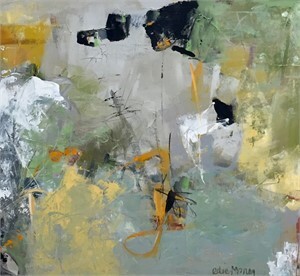 Maney began her art education by attending various institutes, classes at Belmont University, Watkins, and Vanderbilt University as well as studying with renowned artist Anton Weiss for six years. Starting with watercolor and collage, she moved into painting acrylic and finally, falling in love with oil painting. Maney has exhibited in several solo and group shows receiving numerous awards. Collectors of her work are both domestic and International. ​One of her Maney’s favorite series happened after she looked over her photographs from a wonderful trip to Australia and New Zealand in 2011. Wanting to paint something based on her images and not painting in a realist manner, she found a way to translate the scenes into her abstract style naming the Series Australia and New Zealand on My Mind. France was their next trip in 2013 and she named the Series Liquid Light using Golden’s liquid acrylic paint and because Paris is the City of Light. This series incorporated a predominately cream and light colored palette reminiscent of the old world cityscape and countryside structures that piqued her delight and imagination. She will continue traveling, taking photos and translating them into her own interpretation. 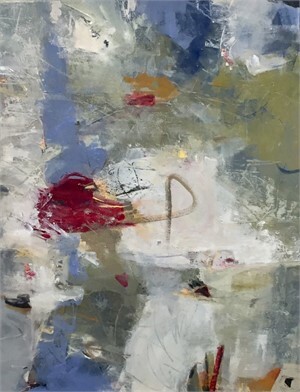 ​Labeling herself an abstract expressionist, Maney starts in a chaotic manner with layer after layer of color and strokes, finding a balance between intensity and motion. Using brayers, credit cards, squeegees, and fingertips in addition to brushes, she continues in an intuitive style. ​Born in Murfreesboro, TN. 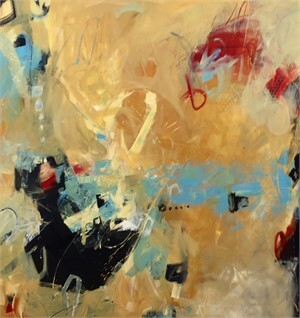 Maney has been committed to painting abstract for over two decades. Attending the University of Georgia, she earned her B.A. in Social Work. Living in Nashville, TN. with her husband, Jerry and her cat, Abstract, she enjoys traveling, exercise and serving meals from recipes of famous artists, especially Monet.